Can downtown Toronto be this quiet? Timeless places are rarely loud, and the Scollard Deli is one of them, established in 1985, but with memories stretching far before that to a different Yorkville. Owner/operator Tom Stavropoulos is sitting in the back patio. 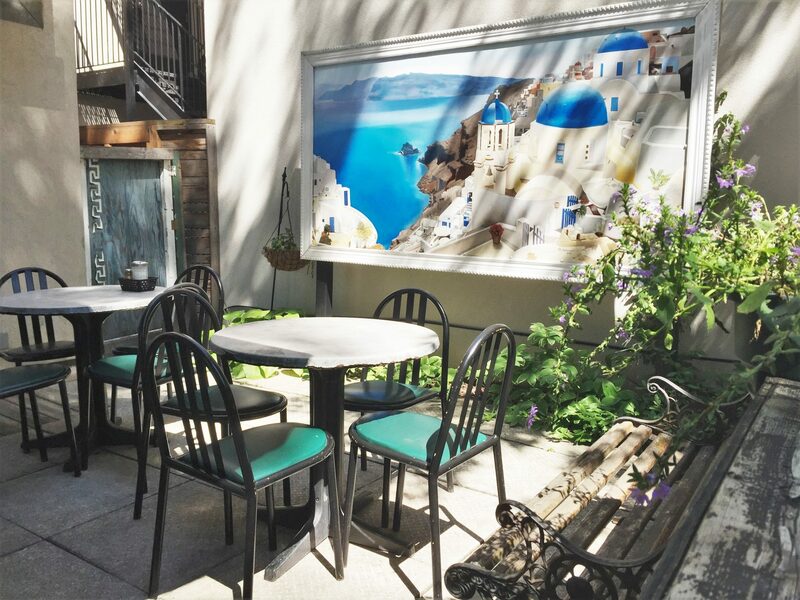 With sun dappling through the trees, a beautiful mural of a hillside in Greece, and a peaceful serenity, the patio is a place where life in an otherwise busy city can slow down and catch a breath. His father first opened a place in Yorkville in 1965 on Cumberland street—a soup and sandwich lunch spot. From that humble beginning, Mr. Stavropoulos then opened a restaurant on Yorkville Ave called “Greektown” in the 70s. 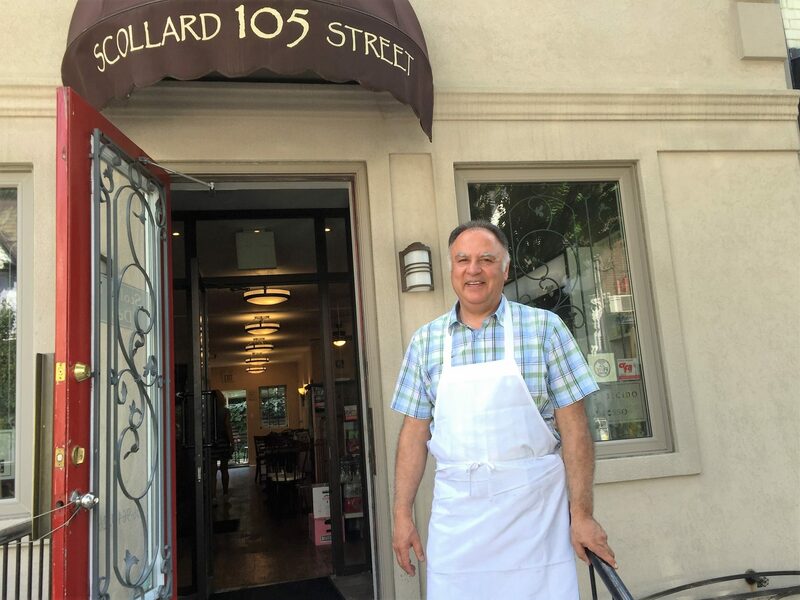 With the 80’s, Yorkville started to change, which was when Mr. Stavropoulos moved on to start the Scollard Deli in 1985. Tom took the place over from his father a couple years ago, though his father still drops by often. Tom says that they both remember the days when Yorkville was very different—a hippie hot spot with cheap rent and endless coffee houses. “Yorkville reinvents itself every 5-10 years” he says. It’s hard to keep a small business going while the value of the neighborhood has skyrocketed, but Tom’s family owns the place. With a combination of “good pricing and good product” and a perfect rating on Yelp, the deli is still going strong after 30 years in operation. Almost every review mentions the patio. The breakfast special (cooked until 11:30) is popular, as well as the authentic Greek chicken salad, and tourists seem to enjoy the good food, reasonably priced, and the ability to pick up convenience items which they might have forgotten to pack, in the little store at the front of the deli. The mural in the picturesque Scollard Deli patio. Scollard Street, Tom says, still has a bit of that old-Yorkville charm. It’s quiet, mostly small businesses, mixed with some residential. He feels a sense of community with the other small business owners on the street: he often serves them lunch, and they share a common experience of constantly adjusting to change. He’s not against development, so long as it keeps the charm of the neighbourhood. Even sky-high condo buildings can fit in well enough with clever architecture, such as keeping the taller part of the building set back from the street or using the facades of old houses on the street. He’s optimistic that more people and more activity will help everyone in the neighborhood and bring in more customers, though he does think that there should be more restaurants taking advantage of outdoor seating. On a day with beautiful summer weather, it’s hard to disagree. Like his father, it’ll be a long time before Tom retires. He hopes that someone will take the deli over and balance the excitement of new ideas with the long-established sense of community that the Scollard Deli represents. Perhaps as Yorkville keeps changing, the Scollard Deli will remain timeless. Disclosure: The author received one cup of free coffee from the Deli that Tom refused to be paid for. It was really good—strong but not too acidic. Click on the arrows or swipe to view next photo.